Maria Piano - Edmonton's Burial & Cremation Professionals | Trinity Funeral Home Ltd. It is with heavy hearts that the family of Maria Piano announce her peaceful passing on Saturday July 23, 2016 with family by her side. Maria is survived by one daughter, Giovanna (George) Girard and one son, Antonio (Graziella) Piano. She will also be greatly missed by her grandchildren, Elisa, Sabrina, Adriano, Dania and Nadia. Maria is also survived by one brother and two sisters, Michele (Nicolina) Tagliamonte, Assunta Montanaro and Giovanna (Luigi) Manucci; sisters-in-law, Maria Tagliamonte, Tina Piano, Carmela Armani, Ninetta Villani and Dolorata Tagliamonte; brothers-in-law, Gino Piano, Nicola (Antonietta) Piano, Gennaro (Michelina) Piano, and Antonio (Brenda) Piano. 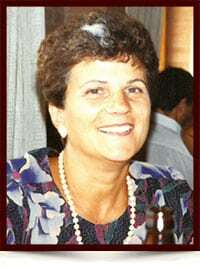 Maria was predeceased by her husband Pietro in 2008 ,parents Giuseppe and Angela Tagliamonte, brothers, Angelo Tagliamonte, Antonio Tagliamonte and Nicola Tagliamonte; brothers-in-law, Mario Piano, Giovanni Villani, Antonio Montanaro and Ermanno Armani. Maria’s family would like to thank Mary Jane and Venta Staff for the exceptional care and love they gave her.